I have a double window in my office that is just calling out for a window seat. Can you hear it?? I was tossing around ideas on how to best use the space underneath for storage, when I found out that my grandma was coming to stay for two nights. She lives in West Virginia and we’re in NJ. Grams is not able to walk up the stairs and needed a place to sleep on the first floor. That was enough to motivate me to put a smaller bed back in my office and luckily we had an extra twin mattress lying around. 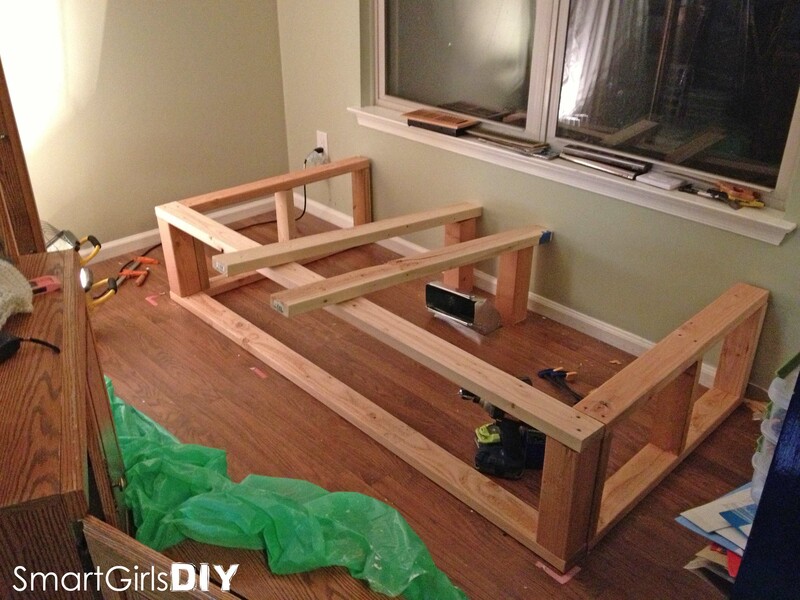 That my friends is how my window seat day bed idea was born. 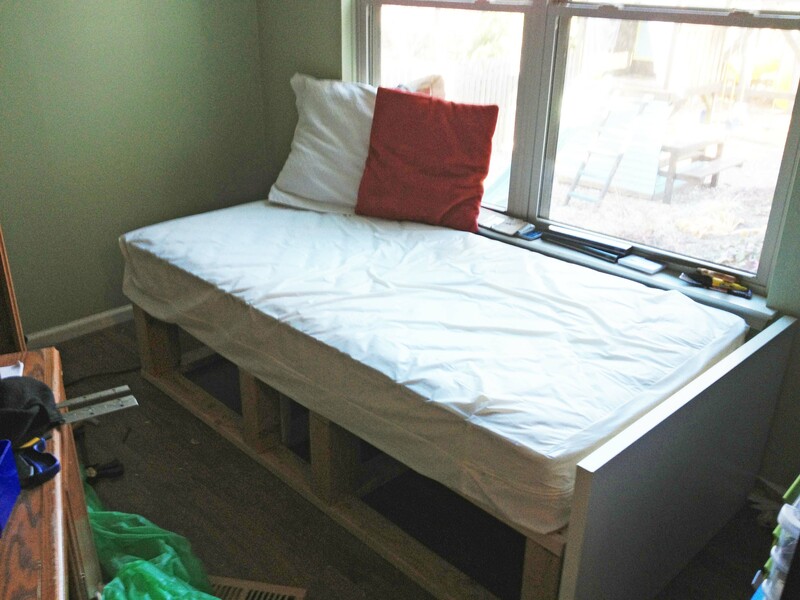 The windows are pretty low and the mattress is 7″ thick, so that left only 16″ for the bed frame. That’s the main reason I just left the floor exposed, if I built a base of some sort I would have lost valuable height. 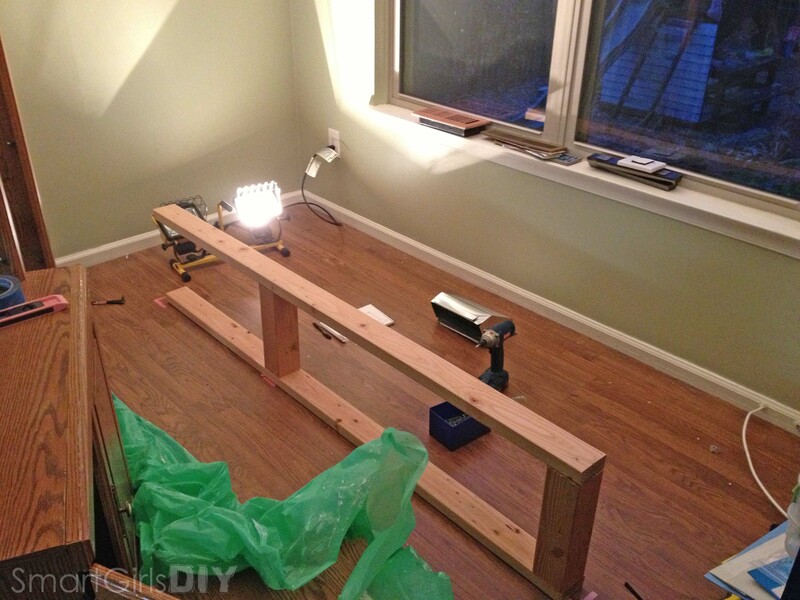 The good news is that the frame is 40″ deep and 74″ long, so there’s still plenty of storage. While I did draw out a few sketches, this project was more design as I go. 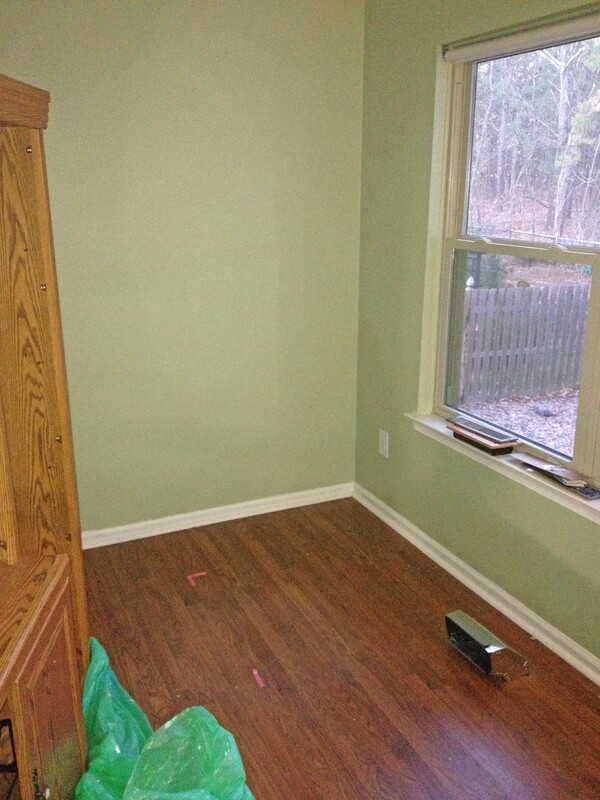 As you’ll see in the pictures, there’s a vent right in front of the window, which had to be extended out the front. That’s why the top is made of a fixed piece of plywood in the middle and two hinged pieces on the sides. Something that changed along the way is that I originally planned to put the hinges all the way back by the wall, but while testing things out with the mattress I realized I was going to need a spot for the mattress to sit when I up ended it to reach the storage below. Does that make sense? I’ll have to go back and take a picture for next time. I shared a few pics on Facebook already, but this is everything I have so far. Of course it’s not finished yet. I got it just finished enough for Grams to sleep on and haven’t done anything else with it since she left. First I marked out the dimensions on the floor. Then started building the front. Most of this was scrap, but I did buy a few 2x4s. My littlest helper. Did I mention I was watching on demand on my computer the whole time I was building? NCIS got so good I had to take a break and munch on some kettle corn. (Recipe HERE) Seeing what it looks like with the mattress on it. The hinged areas are not the same size because the vent is not centered. No worries, but the hinge on the left had to be cut a few inches. This was hubby’s contribution, he cut it with a handsaw. I am not a fan of non power tools. I thought about using plywood or MDF on the front, but I’m super happy with the plank paneling I went with. The package was $10.86 and because I was able to cut each piece in half, one package should be enough for the whole thing. All ready for Grams! Stay tuned for the rest of this project. 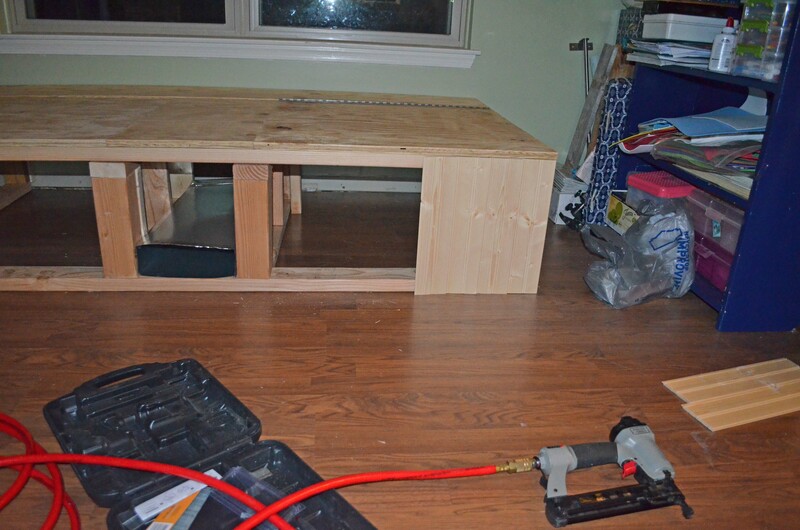 I am going to build a wall unit and finish this bed.